Guaranteed low price. If you find a lower price elsewhere email a link to pricematch@thinktonight.com and we will beat it by 5%. The complete set of 14 miniLUK titles together with a starter pack. The starter pack contains a controller, a workbook (which contains exercises reprinted from the other workbooks in the set so you get no new exercises), a skills chart and a parent-teacher guide. Our displayed price is the Manufacturer's Minimum Advertised Price. If you find a lower price we will price match. Email us with a link to a competitor's offer and we'll beat it by 5%. These titles are also available for sale in two and three workbook sets. The starter pack can be purchased separately. MiniLUK is a complete intellectual development system for children aged from 5 to 7. It is designed to maximize children's learning through play while remaining flexible enough to meet individual needs. It contains one easy-to-operate controller with 12 numbered tiles and a series of workbooks targeted for various intellectual development areas. 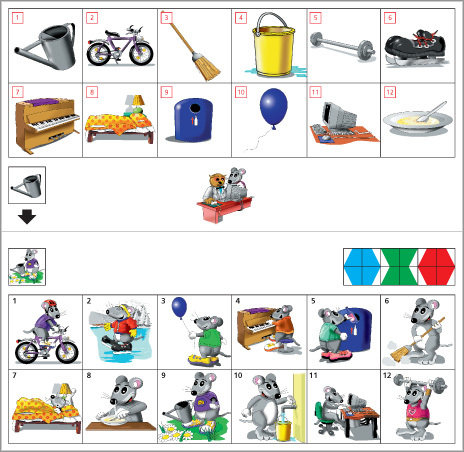 With vivid illustrations, challenging contents, and a consistent learning model, miniLUK offers more complex activities that those in bambinoLUK in the areas of memorization, concentration, visual perception, logical thinking, vocabulary and language skills, mathematical skills and more. Each two or three books set below focuses on one skill area. More complex material is available in the miniLUK Advance workbooks. Static and animated demonstrations illustrating how the controller is used with the books are available. The controller enables a child to work independently and check their own answers. Children develop perseverance and concentration. Unlike a traditional workbook with exercises which can be completely only once the miniLUK exercises can be done many times. Adapting problems by requiring a child to work from the answer to the question, for example, or asking them to explain their process as they work through a problem adds play time and learning value. The miniLUK set is ideal for families to use for portable, independent learning of core thinking skills. The independence with which is can be used makes it very useful for learning center use and to have on hand for those children who complete the assigned work in advance of other students. Product shipped fast and was perfect! Service was excellent. This item is great for kids!